And so it went. In college, she brought coolers of beef to tailgate parties. Not ground beef. USDA Prime, dry-aged, New York strip steaks. People thought she was rich. They didn’t know her family has been in the meat business since 1865 and that prime, dry-aged beef is its specialty. When Strassburger gets to her office at Strassburger Meats in Carlstadt, she still feels lucky, even though it is 4:30 am. She used to get in earlier. But at 46, as president and sole owner of the company, she has certain privileges. “Every 10 years I give myself an hour,” she says. Also on hand will be her younger sister, Andrea, 40, whose title, chief culinary executive, doesn’t really describe her job. A deft cook and butcher, Andrea (pronounced on-DRAY-a) speaks softly, smiles warmly and carries a big cleaver. “Andrea has the most important job in the company—she’s the money collector,” says Suzanne. The three of us are having lunch at their favorite Carlstadt restaurant, the palatial Il Villaggio on Route 17, which serves Strassburger beef. How does that go over? I ask Andrea. “No!” they say in unison, laughing. Like their better-known competitors—DeBragga & Spitler and Pat LaFrieda, both also based in Hudson County—the Strassburgers are purveyors, not ranchers or packers. Wholesale meat prices vary daily, depending on weather, time of year, cost of feed, foreign demand and other factors. Purchasing is done mostly over the phone, often with the same person year after year. Personal relationships are key. 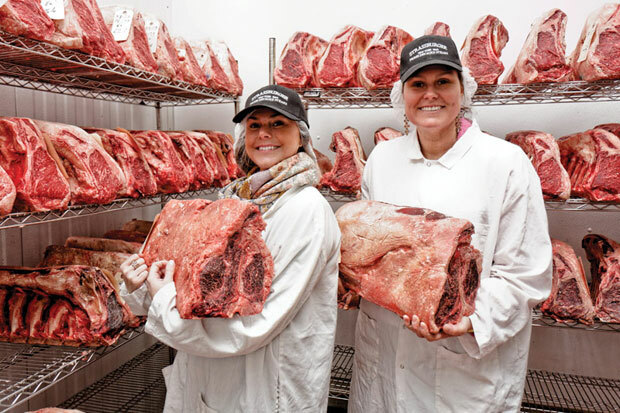 Suzanne and Andrea are the fifth generation of their family in the meat business. In the late 1800s, their great-grandfather Harry Strassburger, the son of an Alsatian immigrant, set up Strassburger Meats in the Bronx with his wife’s father, a long-time manager for Armour and Company. Strassburger Meats later moved to the 125th Street Meat Market in Harlem. Suzanne apprenticed there in her teens. After college, she worked various jobs in catering and the meat business before settling in at the family firm, which by then had moved to West 14th Street in Manhattan. In 2002, Suzanne succeeded her father, Peter, as president. In 2006, she moved the company to Carlstadt. 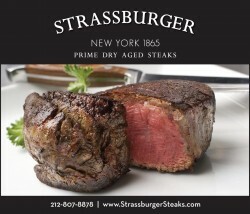 Strassburger Meats supplies several top New York steakhouses, including Keen’s, Smith & Wollensky, Frankie & Johnnie’s and the Dutch. In New Jersey, its main clients are Il Villaggio and the Wayne Steakhouse in Wayne. “We are looking to expand in New Jersey,” Suzanne says. 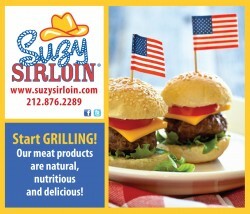 She has not put the nickname Suzy Sirloin out to pasture. Instead, she gave it to the line of organic ground beef and natural beef, lamb, veal and pork she created in 2011 to sell in boutique markets. It’s also available on Amazon. “I wanted to make the meat department less intimidating to women,” she says. “It seems to be working. We’ve doubled the business every year.” In 2012, Williams-Sonoma began selling Strassburger’s prime dry-aged steaks online. Four 20-ounce porterhouses are $249.95, plus shipping. Suzanne always wanted to work for their father. At Peter’s insistence, she started the way his father, Frank, insisted he start—at the bottom, “in the cooler, learning meat.” In her early days, the industry still shipped what are called hanging carcasses, whole sides of beef that get moved around the facility on hooks connected to ceiling tracks. This immersion in macro proved a great way to learn. Over the years, carcasses gave way to smaller cuts, shipped as what’s called boxed beef. One day after college, she was in a bucket brigade of workers loading 30-pound roasts onto a tractor-trailer. “The floor was slippery with fat and blood, and we were falling behind,” she says. “I was a volleyball player, in great shape. I kept yelling, ‘Faster, faster!’ Finally they whipped one at me so fast it knocked me over. I landed in the fat and blood. My hairnet came off. I was a mess. Being the owner’s daughter cut her no slack. “Suppliers would try to send you things you didn’t order, or price you higher than you agreed on.” Those she sold to were just as determined to save a nickel. These days, Peter and Barbara Strassburger live year-round in Florida. He still talks business with his daughters every day. “Like 11:30 on a Saturday night, when I just want to go to bed,” says Andrea, rolling her eyes. Do you get used to that after awhile? “Just kidding,” they say primly. That morning, after a tour of the Carlstadt facility, I had asked them to put me on the phone with Peter in Florida. Suzanne herself never stops. In 2010, she earned her Masters of Beef Advocacy certificate from the National Cattlemen’s Beef Association (NCBA). She created and regularly updates thesirloinreport.com to share information about beef and all aspects of the business. In March, she was heading to Denver for more NCBA training in beef production, animal care, food safety and environmental stewardship. Both daughters say they never felt their father wished he had a son to pass the business onto. Still, Suzanne admits, “I never really had a woman role model until I was in my 40s.” That’s when she met and became friends with Rosemary Mucklow and Temple Grandin, the only females in the Meat Industry Hall of Fame. Its 58 members include Ray Kroc, Frank Perdue and Colonel Harland Sanders. Mucklow, who led the National Meat Association, and Grandin, whose autism helped her pioneer humane methods of slaughter that are now the industry standard, were inducted in the inaugural class of 2009. “I absolutely encourage women to get into the business,” Suzanne says. She bristles, however, when I ask about grass-fed versus grain-fed beef or about Concentrated Animal Feeding Operations, the crowded, industrial feedlots known as CAFOs that Michael Pollan railed against in his 2007 polemic, The Omnivore’s Dilemma. Pollan would probably agree with that last part, I tell her. What’s worrisome are the feedlots. The people I’m talking about, I say, are not against all meat. Earlier, I had raised another subject I thought might get her dander up, but it didn’t. None of the three Strassberger daughters are married. Would Suzanne and Andrea someday like to pass the mantle to a next generation? “We just haven’t met our matches,” she said with a shrug. How do guys react when you tell them what you do for a living? Are guys intimidated by a woman running a macho business like meat?